On Friday we did some touring of Hong Kong island. The weather was not great but it did mean we did not feel bad cruising through vast shopping malls fulled with Prada and Clarins stores. 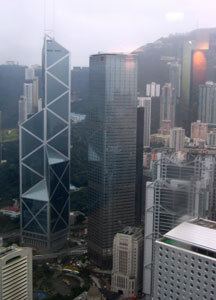 After some searching we found the lobby for the International Financial Centre I, a really impressive 100 story tower. There is a public library on the 55th floor but no public observation deck. After getting some visitor id tags we took the express lift up there. The lift had CNNs financial news showing which was quite funny and the 55 level trip took less than a minute.The view was amazing and the quality of the IFC tower both inside and out is second to none. Whilst not a true observation deck the library had more tourists than researchers trying to snap photographs of the amazing view. It was far more impressive than the view offered by the Sky Tower and whats is more it was completely free.